To you and me, organic groceries are a luxury. To the children of the future, organically-produced food will be a necessity. We often hear that agricultural industrialization is the key to feeding the world. But, in the face of climate change, conventional agriculture will fail us when we need it most. When this happens, organic farming systems will offer a sustainable solution — but only if we take action to support our organic farmers today, via changes in both policy and consumer habits. The last five years make up the five warmest years in recorded history, with 2018 ranking as the fourth-warmest year on record. The effects of climate change are becoming increasingly severe, particularly for the agricultural sector. Higher temperatures mean more evaporation, which dries out soils. Chronically dry soils lead to reduced agricultural productivity. In 2015, California’s agricultural sector lost $2.7 billion and 21,000 jobs due to severe drought. Organic farms, however, are resilient to water-scarce conditions. This is because soils in organic systems are able to absorb and retain more water than conventional soils. The Rodale Institute Farming Systems Trial has shown that organic corn yields are higher than conventional yields in drought years. Furthermore, organic soybean plots yielded 52% to 96%more than conventional soybean plots during 1999, a severe drought year. In a future that is warm and dry, biodiverse organic farms will outperform conventional monocultures. Ironically, industrial agriculture is digging its own grave. Despite being immediately threatened by climate change, agriculture is one of the largest contributors to greenhouse gas emissions — making up about one quarter of global emissions. Organic farming systems can help to reverse this trend. According to the United Nations’ Food and Agriculture Organization, organic farms require significantly fewer energy inputs than comparable conventional farms. It may also be that organic agriculture is one of our greatest assets in the fight against climate change. Organic farms around the world have the potential to store up to 2.4 billion metric tons of carbon dioxide in their soils every year. Considering that the typical passenger vehicle emits 4.6 metric tons of carbon dioxide annually, this would be the equivalent of removing nearly 522 million cars from the road. There is some concern about the higher cost of organic products. But, as organic techniques are adopted around the world, production costs will fall, and shoppers will pay lower prices. This process is already underway — the cost of organic spinach has fallen by more than 53% since 2004. But, for this trend to continue at the global scale, we need to invest in organic agriculture now. In the 2018 Farm Bill, policymakers took a step in the right direction. 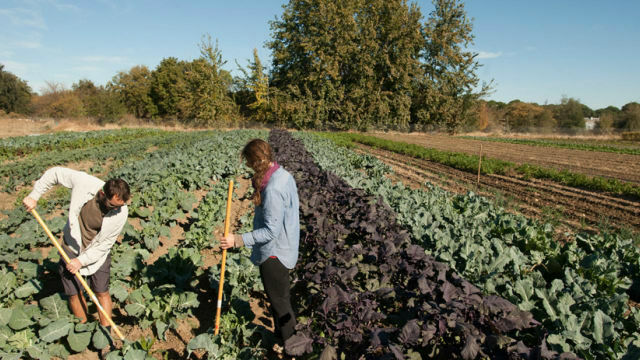 Funding for the Organic Agriculture Research and Extension Initiative will be expanded to $50 million per year by 2023. The bill, however, fails to adequately support organic farmers. Crop insurance payments are primarily given to large producers of crops like corn, wheat and soy. If the farm bill were to reallocate some of this funding to support farmers as they transition to organic systems, more farmers would be incentivized to make the switch. This would create the foundation for a growing network of organic producers in the United States. Unfortunately, policy is riddled with special interests and is often slow to change. As a result, consumers must drive the demand for organic food today. There are a number of actions that you can take now to support organic farmers. Purchase products with the “USDA organic” label. Find out where your local grocery store sources their meats and produce. Encourage friends and family to buy organic. Go to farmers’ markets and talk to local growers. Luckily, San Diego plays host to about 50 certified markets. On Sundays, the Hillcrest market takes over the DMV parking lot. Ocean Beach offers to fill your Wednesday afternoons with live music and organic produce. Every Saturday morning, Little Italy boasts one of the largest markets in the county — right in the heart of downtown. There will come a day when conventional agriculture will fail to yield, and organic farmers must be ready and able to feed the planet. A few extra dollars spent on organic products today is an investment in the long-term food security of tomorrow. For the sake of my future children and grandchildren, I will do my best to pay. Jonathan Worley is an undergraduate student at Stanford University studying human biology. He grew up in Kensington, and graduated from High Tech High in Point Loma in 2016.